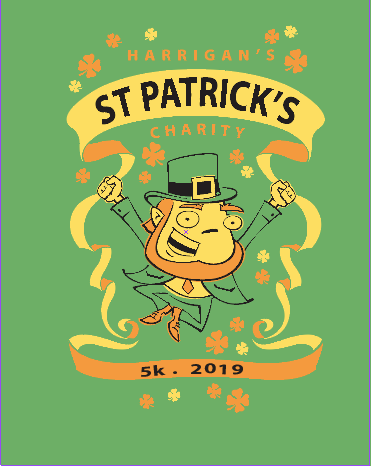 The annual Harrigan’s Charity 5k – the best of both worlds: a fun walk/run for all ages and a timed race for the competitive types. Food, refreshments, door prizes, medals for category first, second, & third places come dressed up in your favorite St. Patrick’s Day outfit. Where: Harrigan’s Tavern/K&G Bike Center, 4070 Marshall Rd, near the corner of Stroop and Marshall Road, Kettering, OH 45429. Harrigan’s plans to open at 9:00 a.m. and remain open after the run for runners’ warmth & fun. On-line registration: Speedy Feet available until midnight, Wednesday March 20th. Mail-in registration: Send registration forms to: Harrigan’s Charity 5k — 6880 Springfield-Xenia Rd, Yellow Springs, OH 45387. Make checks payable to Greene Giving – mail registrations must be received not later than Monday, March 5th to be processed for early packet pick-up. T-shirts: Technical shirts go to the first 150 that register, and cotton shirts to all participants who register by two weeks before the event. The sizing on all shirts is Men’s sizing, so when you register please keep that in mind. Charities we support: Alzheimer’s Association of Dayton, United Rehabilitation Services of Dayton, South Community Positive Health Options, and the local chapter of the Juvenile Diabetes Research Foundation.